Some in OB and Point Loma remember it as the old Domino’s Pizza place on upper Voltaire Street. Others knew as a surf-board making business. However the place is remembered, changes have begun which will result in the construction of 28 2-and 3-story townhomes along Voltaire, east of Catalina Boulevard. 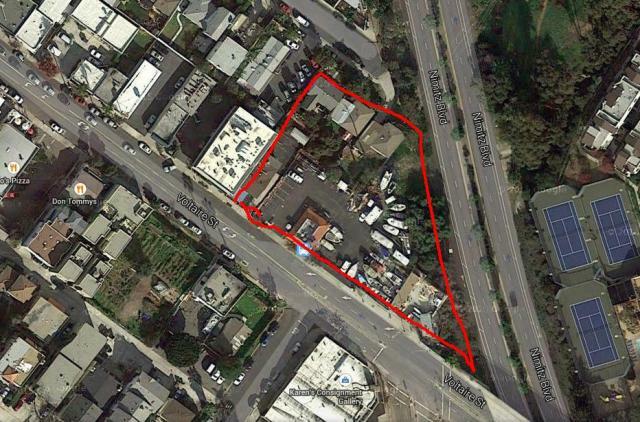 Called the “Upper Voltaire Mixed Use” project, demolition has begun on the one-acre triangular-shaped piece of Point Loma that overlooks Nimitz Boulevard. Designed to bring in “quality townhome residences”, the units will include 2 or 3 bedrooms with an average of 1,450 square feet. 17 of them will be 3-stories and eleven are2-stories that will rest over retail storefronts. All the planned units will have a deck, and some will have two, plus garage spaces. Map is from project’s website. More detail from a blow-up of original. Our reliable source says that all the permits are current. This project was appealed at each level and none of the appeals were successful. This overly dense project will dump most of the traffic onto dead end Whittier St. with the only exit being Famosa Blvd between Voltaire and Nimitz. We showed the city that the Level of Service (LOS) for Famosa was the lowest possible grade; the street was way beyond capacity. This fell on deal ears. Traffic will also come in and out of Voltaire just east of Catalina, another street with a very low LOS rating. Also fell on deaf ears. I spent several days taking pictures of backed up traffic on Voltaire, Catalina, and Famosa and presented this in a Power Point presentation to the city to no avail. Our current mayor proposed approving the project at the time. We pointed out that there were several developments planned for these same blocks, another only slightly smaller one was approved across the street from this one. We asked the city to do a comprehensive traffic study to take in all the proposed projects. Nothing. God help anyone seriously hurt, in an accident. Hope the paramedics will be able to get through the gridlock. It’s going to be like 11pm, 4th of July, every day, twice a day, all year long. Are 28 more cars really going to make it like 4th of July when literally thousands of cars come into to OB? Demand for a limited supply of coastal real estate continues to grow, and this blog bemoans the gentrification of our area as apartment buildings are flipped and cottages are scraped for large single family homes. But how else can housing affordability be maintained without the increased density that comes along with increasing the supply of multi-family dwellings like the proposed project? 2-3 bedroom units will only one 1 vehicle? Thanks for pointing that out to him objamie. Oh sorry. 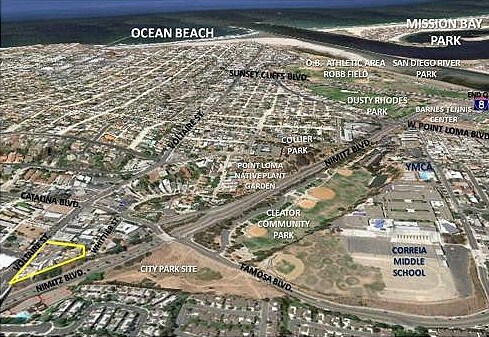 Are 84 cars (3 x 28) really going to make it like 4th of July when literally thousands of cars come into to OB? First, comparing to the 4th of July makes no sense, that is what is called an “outlier” in data. Second, 84 cars won’t make one trip a day. The projection calculates 454 trips a day in and out of the project, that’s what the developer’s biased “traffic study” showed. Exactly my point in responding to Debra’s comment; 4th of July is an outlier and not useful for comparison. If the ADT is 454, what’s the peak? The peak is what will be significantly discernable as a negative impact, not the average daily. What will be the peak? They don’t calculate the trips that way but common sense says the peak will be at the peak hours for everyone, morning, noon, and evening, with whatever business traffic is generated by the businesses that move in. Look across the street, a new Coffee Bean is going in, what traffic will that generate? What if high traffic businesses move into this new project. I missed the connection to Debra’s comment, my mistake. Just because there is “demand for a limited supply of coastal real estate” you think that is a reason to densify and over crowd the coastal areas? The desirability of the area will degrade the more crowded it becomes. What’s wrong with trying to prevent that? What will there be for people to aspire to if we ruin this? I have a friend who lived for years in La Mesa and dreamed of and WORKED toward a goal of one day being able to live at the beach. At the age of 50, he was finally able to buy that house and he is over the moon about it. So, do you want to tell him that we need to overcrowd the coast now just because there is a demand out there for everyone to have easily what he worked so hard for? Not me. The world is full of too much entitlement, what ever happened to earning entitlement? I stand by my comment. Three cars per unit at a bare minimum. The last coupld of neighbors who moved in adjacent to me, have generated now EIGHT cars, ALL parked on the street. Just because those condo’s will have garages is no guarantee they won’t be filled with stuff and more cars on the street + bicyclists (new law will make passing someone impossible) = traffic congestion. And don’t forget, during rush hours, people are not only going somewhere, they’re coming in from other areas, too. San Diego’s population has doubled since 1970, most of the city has felt the pain of congestion and density because of it. What’s the basis of your argument /the beaches should be treated as protected statud regarding development? Your story about your friend kind of pushed a button for me, do you own your own home? I see different arguments about development in the area. Some are by folks who despise change. Others don’t like corporations making profits or don’t like the upper class moving into their former funky eclectic community. All fair enough. One I don’t see much reason to recognize is that of homeowners who don’t want any new development or density and don’t care about housing shortages because they figure “I got mine now so to hell with everyone else and isn’t it great the value of my home has tripled since 2000?”. Maybe I have your position all wrong, in that case it still applies to many on that side of the issue. The entire planet is losing open space and seeing population density. Anyone desiring immunity from it better have a pretty good reason. “What’s the basis of your argument /the beaches should be treated as protected statud regarding development?” The beaches are used by everybody. We already experience huge in-migrations every summer with thousands of tourists and lots of people during the rest of the year. The beaches are a resource that should be protected. On top of that, as I described, living here is something to ascribe to but it surely won’t be in the future if we turn these areas in to anthills. “Your story about your friend kind of pushed a button for me, do you own your own home?” Yes, I do. Why? “One I don’t see much reason to recognize is that of homeowners who don’t want any new development or density and don’t care about housing shortages because they figure “I got mine now so to hell with everyone else and isn’t it great the value of my home has tripled since 2000?” While there may be some people with this attitude, I believe the majority simply want to maintain the quality of life they have and they see adding thousands of residents in dense multi-family developments as detrimental to that quality. That is also quite fair. “Maybe I have your position all wrong, in that case it still applies to many on that side of the issue. The entire planet is losing open space and seeing population density. Anyone desiring immunity from it better have a pretty good reason.” I’d have to disagree with that generalized statement. If you look at the developing world, it is the cities that are growing and becoming over-crowed, people are leaving the country sides in droves for jobs in the cities. Where in the world is all this open space being threatened? But, that general argument doesn’t mean we should step aside and let the bulldozers come on in. Fighting to protect your home is a time-honored tradition. This argument you have offered is what the development community wants everyone to hear as they embark on the new frontier of development, INFILL. I am sure you will disagree but I would summarize your reply as validating my points rather than refuting them. How is “maintaining quality of life” not synonymous with “I got mine”? The argument about beaches, access and tourist influx really doesn’t apply here. Tbe intersection in question is absolutely not en route to any beach and over a mile from tbe sand. Not sure where we would draw the line there. North Park has been consistently exploding in density for some time, I am sure someone must go through it on their way to a beach somewhere? In the end I would assert it is indeed your right to resist anyone else moving into your neighboorhood that you feel is already overcrowded. Just as people in North Park and anywhere else would do. As a semi democracy such primal human gestures as defending ones territory are tempered by written laws and rules since each of our individual interests can not all come first. If the project is up to code it will be built just as the home you live in was. Those with an extreme aversion to population density may have to go back and rethink their decision to settle within fhe immediate coastal area of Americas seventh largest city. “I am sure you will disagree but I would summarize your reply as validating my points rather than refuting them. How is “maintaining quality of life” not synonymous with “I got mine”?” These are two different positions. One is completely selfish, the other voices a broader concern for preserving something that benefits a great many people; but, it depends on the lens you are looking through as to whether or not a person sees that as a selfish position. “The argument about beaches, access and tourist influx really doesn’t apply here. Tbe intersection in question is absolutely not en route to any beach and over a mile from tbe sand.” This intersection is a direct route to the beach at the end of Voltaire St. and it is almost exactly one mile to the sand. It is one of the three main routes into the area so the access and tourist influx does indeed apply. “Not sure where we would draw the line there. North Park has been consistently exploding in density for some time, I am sure someone must go through it on their way to a beach somewhere?” And your point would be what with this statement? “Those with an extreme aversion to population density may have to go back and rethink their decision to settle within fhe immediate coastal area of Americas seventh largest city.” It always amazes me how anyone who expresses a negative opinion of a project is immediately branded with several descriptions that obscure the issue, in this case “extreme aversion to population density.” Where did you get that? Why are you extrapolating this issue into an overall position on density that you attribute to me? Did it ever occur to you that we are just talking about this particular area with streets that already have the lowest Level of Service grade possible? This discussion isn’t about any “extreme aversion to population density” it is about this section of the community that will be severely impacted by this project and the others coming behind it. It is much easier to write a person off with a simple tag like NIMBY than it is to seriously look at the project and the community it affects. Dismissing someone by using one of these anti-development tags is, frankly, intellectually lazy. And, as for your statement about rethinking the decision to live at the beach, that makes as much sense as telling people who bought homes before the advent of jets that they should rethink where they decided to live. Or tell that to the folks in Little Italy who moved there before Interstate 5 divided their neighborhood. People make decisions on where to live based on information available at the time. Then, if changes are proposed, these people have a right to speak up and that we are doing. I was really hoping to let us agree to disagree, but after that “intellectually lazy” comment in the same post as an outright lie I can’t let that go. Its not the end of Voltaire St. (petty detail) and who the hell is that a direct route to the beach for? Even for people coming up Nimitz N/B, WPL is more direct. Oh wait come to tbink about it its the most direct route for one snall niche.. tbose of you on the hill complaining. So I apogize for saying its a lie when its just intellectual dishonesty but now thats a double on tbat because youre alrady using the “we are at the beach” card. As for that I-5 little italy thingy…. is this the same thing? Youre just insulting my intelligence. Argue all you like but there are undeniable facts here. One is that the effect of homeowners blocking all development is housing shortages which drives up the value of their property and rents for the have nots. Enjoy your castle on the hill, Baron. I don’t know why I just received this on the 22nd even though it looks like it was posted on the 6th but “intellectual lazy” and “outright lie” both deserve replies. Check a map before you make such comments, John. The beach is at the west end terminus of Voltaire St. And, it has been a direct route to the beach for me for 28 years, that is who the hell it is a direct route for. I’m sure there are others. You wrote: “Even for people coming up Nimitz N/B, WPL is more direct.” When you said “up Nimitz, I will assume you meat northbound traffic. Nimitz to Wabaska to Voltaire is much more direct route than travelling further north to West Pt. Loma, anyone who drives this area would know that. If you meant southbound on Nimitz, Sunset Cliffs to West Point Loma is faster than continuing south on Nimitz to West Point Loma. Anyone who drives the area would know that too. I don’t live “on the hill,” I live two blocks west of Catalina and Voltaire. Lots of folks, who don’t live “on the hill,” a phrase I’m sure that was intended to be a pejorative, use Voltaire to get to the beach. As for intellectual laziness, the seven [sic] notations I had to insert to make sure everyone knew I was quoting you directly, don’t demonstrate intellectual vigor on your part. You wrote: “As for that I-5 little [sic] italy [sic] thingy [sic]…. is this the same thing? Youre [sic] just insulting my intelligence.” My only response to that comment is that I don’t believe it is possible to insult something that doesn’t exist. You wrote: “Argue all you like but there are undeniable facts here. One is that the effect of homeowners blocking all development is housing shortages which drives up the value of their property and rents for the have nots.” If you had some reasonable capacity to understand, you would understand the difference between no development and reasonable development. Finally, you resort to name calling, the resort of those who can’t think of anything else to say when you wrote: “Enjoy your castle on the hill, Baron.” You didn’t even get my name right, it’s Geoff, not Baron. Pre or post prop D? Every year since prop D there have been a dozen empty parking spots at dog beach by 7-8 pm. I don’t understand this comment, what are you meaning to say? A non serious comment about the “gridlock like 4th of july” comment. In the 80s gridlock it was. Now not so much. I remember that site as my brothers’ Volkswagon repair shop. (Precision Volkswagon) back in the early ’70s. The city put him out of business by condemning the property, saying is was falling down onto Nimitz. It’s going to take a lot of shoring or looking the other way by someone. I can’t imagine that big of a project on that little postage stamp of a property. Welcome to traffic gridlock on Voltaire. 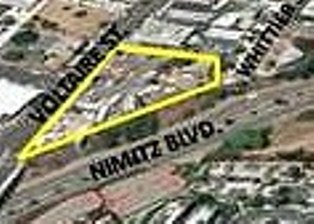 The developer plans to excavate all the way down to Nimitz for the underground parking. We tried to get them to consider an egress/ingress from Nimitz to prevent the problems the traffic will cause but they said the city would not let them. I’m sure the subject was never broached with the city. taking out that much dirt could seriously weaken that whole cliff area. are you f*cking kidding me? Trust me, I’ve been in the construction business all my life and this can be done effectively. The developer said his project would improve the look from Nimitz. But, no entrance or exit. There is currently a center island on Voltaire at the proposed driveway location, so the driveway could only be entered from or exited to westbound Voltaire. If that island were to be removed, good luck turning left at rush hour. During the afternoon rush hour, traffic on westbound Voltaire backs up through the light at Wabaska and across the bridge over Nimitz. The light at Wabaska turns green and there is no place to go. That is partly because Voltaire narrows down from two lanes to one approaching Catalina. It is also because there are just too many cars and not enough road to handle them. In the past, I recall hearing a proposal to replace the traffic light at Voltaire and Wabaska with all-way stop signs. Is that going to be part of this project? Years ago there was a building at the east end of that property, an auto repair shop called “U Can Do”. It was visibly leaning down the embankment toward Nimitz Boulevard. Since that building was torn down, the lot has been fenced off. Did the developers consider any possible instability of that land? Thanks to the OB Rag for keeping us informed about the city’s plans for our neighborhood. I agree with everything you said. A few additional items. I think the “bridge renovation” is being done intentionally to accommodate this project and the others. The islands are coming out and the changes will benefit the project. If you read my other post, I explained what will happen with the dirt cliff down to Nimitz. The developer did float the idea of an all way stop at Wabaska that we said was a horrible idea. The traffic count on Voltaire is about six times what is on Wabaska. Making every car stop at Wabaska would be idiocy. I checked some of the current documents on this project and the work does include removing the traffic signal at Wabaska, something I intend to investigate more. Chicken Litty and the Nimbies have come out to crow. Like the completed project at Voltaire and Catalina, this town home development will improve the neighborhood and allow 28 new families to live in our community and not live in a far away suburb where wildlife was destroyed and new freeways built. 28 units will generat about 100 car trips a day, only about 10 to 20 cars during the rush hour. Big freaking deal. The old donut shop/pizza joint was ghetto. I welcome these new townhomes and the families who will live ther. Rufus, you need to pay more attention. It will be 28 units and SEVEN business units. I have no idea where you got that traffic count but it is way off. Where in the hell is there any land left to build suburbs and freeways? There isn’t any, infill is the new development mantra and it sounds like they have you. By the way, where do you live? Do you use the Voltaire and Catalina intersection daily? Let’s be honest about that, I use it daily. The intersection of Voltaire and Catalina is negatively impacted by Navy related jobs and school traffic. Catalina, southbound from 6-8am and northbound from 3-6pm, is impacted by jobs not residents. Voltaire, from 7-9am and from 2-4pm, is impacted by traffic between PLHS, Correia, and Dana. A small change in the number of units should not be blamed for our traffic problems, IMO. I love the positive change occurring on Voltaire. I seen hookers across the street from there before. Are you sure about the hookers ? I have seen women coming out of The Venetian only to rest at the Wabaska stop light. 28 townhomes generates over 190 ADT (Average Daily Trips). I don’t remember the assumption for the commercial spaces, but it will be in addition to the residential uses and will likely be at least as large. This is signficant because the Voltaire/Catalina/Famosa intersection already is failing at rush hour. There goes my neighborhood. I can’t wait to face all of the delays that will come with the construction of something of this scale. I still don’t understand how these projects make it through the approval process. Really? Affordable? There will be nothing affordable about this brand new construction. I’m guessing they will start around $600k. Oh, and increasing density only serves to increase demand on an already taxed infrastructure, and pad the pockets of these developers who could care less about the communities they build in. But hey, as long as there are more “affordable” places for people to live, who cares, right? Can someone please clarify for me if there are four projects proposed in totality on Voltaire like this? The one at Cat. & Vol., this one, and two others? I thought I read that here last year. We hope to be posting future articles on the other projects slated for that area of Voltaire. There were two more planned projects. One was to be across the street from this one and was to be only slightly smaller. The other was planned for the lot where Sunshine Liquor is on the east side of Nimitz south side of Voltaire. It does not appear that these other two are active but at least one, the one across from the Upper Voltaire project, had been fully approved for construction before the recession.